Are you one of the people who suffer from chronic disease? well, you may be interested to read about the link between inflammation to chronic diseases and how to reduce inflammation in your body to reduce the symptoms of your disease. Chronic inflammation is nowadays linked to many diseases and is known for worsening their symptoms. Along conventional treatment, you can reduce the extent of the damage it causes to the body through these foods that are available in every home. So Which foods to avoid, and which to add to your menu? Over time it has became increasingly clear that all chronic diseases originate from internal inflammation that came out of control. Inflammation is the body’s response to injury, as well as to allergy or ongoing stress. These conditions cause the accumulation of toxins that the body cannot get rid of for various reasons, such as weak digestive system or too much load of toxins. Inflammation is actually a natural protective mechanism and repair of the body intended to overcome tissue injury. In chronic conditions the body keeps trying to turn off the inflammation, but is unsuccessful. Chronic inflammation is one of the reasons for fatigue, poor mood, and even the inability to lose weight. Many diseases show more severe symptoms in the presence of increased inflammation. One explanation is that inflammation causes the process and accelerated aging, as well as increases the risk of coronary diseases, strokes and cancer. The inflammation causes accelerated erosion and rifts within the body by increasing oxidative activity. The best way to reduce inflammation is through direct treatment to the cause of it: treating the infection, prevention of allergy, breaking the chemical stimulation or removing pressure off the pinched nerve. 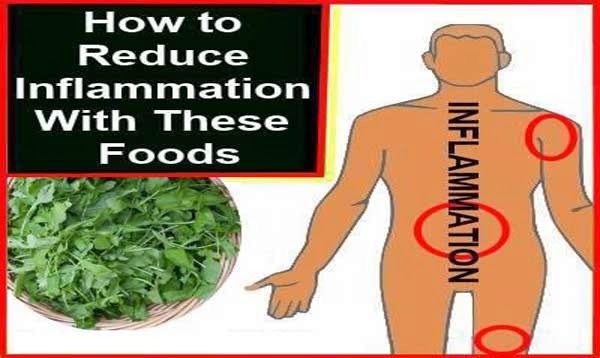 However when the location of the inflammation is unknown, and in other conditions such as rheumatoid arthritis or inflammatory bowel disease, the natural way can help, parallel or not parallel to the conventional treatment, to turn off the inflammation and prevent its recurrence. Sometimes it is not so simple to find all the causes of inflammation, although it is possible. However it’s simpler to use available foods in every home to reduce inflammation without the heavy price the body pays for prolonged use of drugs. Many of us are allergic to certain foods that provoke severe reactions in our body such as intestinal infections, skin problems, or throat irritation, red eyes and more. Even lower levels of allergies, such as lactose intolerance, can cause serious health problems. There are foods that are known to be common allergens such as dairy products, wheat, eggs and vegetables from the solanaceae family such as tomato, eggplant and pepper. In order to reduce allergy – and hence inflammation – you should try to find in every possible way the food that you are allergic to, and check whether there is a need to eliminate one of the above foods from your menu. Deep fried foods have an appetizing smell, but cause a lot of damage to our body. First, the oil is oxidized at high temperatures and becomes a kind of toxin that need to be removed from the body. Second, it’s usually an oil whose refining process destroyed it, or an oil that is a product of a genetically modified plant. Third, the required heating temperature for frying food destroys all essential nutrients in the oil, so it overloads the elimination system of the body. Foods that have been processed and altered their original shape have also lost all the goodness in them. This is food that will not give us what we need from it, and causes us more harm than good. These foods includes snacks, pastries, processed soups and stews, fizzy drinks and more. In the past it was thought that coconut oil is harmful to our health because it is polyunsaturated oil. However more recent studies have found a large benefits of coconut oil to the immune system and digestive system. Coconut oil is rich in medium chain fatty acids that are easy to digest and use as an energy. It has antibacterial properties that help create a healthy bacterial balance in the digestive system. In addition, coconut oil is not oxidized and destroyed in cooking, unlike other oils, and it even reduces the craving for sweets and carbohydrates. Read here more about the amazing health benefits of coconut oil. How to consume it? In cooking, baking and even in health drinks. You need to get used to the taste, but it worth the effort. Note that you should buy unrefined cold-pressed oil, which unfortunately is not cheap. Avocado is a fruit full of healthy oils and is less fattening than liquid oils generously dressed over the salad. Monounsaturated fat, as in avocado, does not increase the level of inflammation in the body. Avocado is excellent for the blood vessels and helps maintain healthy blood pressure. The addition of avocado to salad, for example, instead of the oil in the dressing, will cause you to feel satisfy faster and reduce the need to binge in the afternoon. How to consume it? In any way that suits your menu such as in salads or as a spread on the toast. People who are conscious about their weight can consume half an avocado a day. Like the other foods I’ve mentioned so far, this food has a high fat content as well. Most natural oils have anti-inflammatory properties, whereas most common vegetable oils (soybean, corn, sunflower) are often pro inflammatory. Oily fish contain omega-3 fatty acids that encourage the production of hormones that are very important to relieve painful conditions like arthritis, fibromyalgia and more. Fish oil can also reduce the tendency to excessive clotting. Fish is also a good source of selenium, an excellent mineral to strengthen the immune system by encouraging the creation of powerful antioxidant in the body. Read here more about the amazing health benefits of omega-3 fish oil. How to consume it? Eat salmon, herring, mackerel, sardines and anchovies. If necessary, you can take omega 3 supplement and selenium. It is advised to consume marine fish over freshwater fish. The efficiency of turmeric has been proved in many studies. The active ingredient in turmeric is called curcumin, and it turns out that it has strong anti-inflammatory properties and it also soothes pain naturally. Turmeric has a good effect on the digestive system as well. Turmeric is a versatile spice that is used widely in natural remedies. If you are interested in herbal remedies, you can find more useful information in my e-book the Herbal Remedies Guide. This guide will teach you how to treat common ailments using herbs. How to consume it? Add turmeric to meat, poultry and vegetables dishes, or take a more concentrated form after consultation with a professional health practitioner, in case of severe inflammation. Dark vegetables and fruits, the ones that have dark red or dark purple/blue color, have antioxidant properties that prevent the cumulative damage of excessive oxidation and inflammation in the body. One of the best known antioxidants in this respect are cranberries and cherries (if you eat a lot of them) to alleviate knee pain in rheumatoid arthritis. How to consume them? Incorporate as much of these foods in your daily diet: blueberries, raspberries, black mulberries, red grapes, cherries, red onion, red cabbage, beets and more. To learn more about the healing properties of berries and how to incorporate them in your daily diet have a look at my e-book The Healing Berry Guide. This e-book will teach you how to transform your health with berries. This root has significant anti-inflammatory properties and it promotes digestion and soothes colic. Read more about ginger in my article 6 reason to consume ginger for great health. How to consume it? It is recommended to use the fresh root rather than the powder. Use it in various stews or tea (slice a few thin ginger slices and add a slice of orange, cinnamon stick and honey). Find here a recipe for anti-inflammatory and pain relief turmeric ginger tea. Cayenne pepper contains anti-inflammatory agent called capsaicin. This is often used in creams and other topical mixtures to help relieve pain, especially muscle and joint pain. How to consume it? Cayenne pepper is available as a fresh or dried pepper, ground spice, in capsule form and creams for external use. You can drink cayenne pepper tea (about one quarter to half teaspoon of cayenne pepper steeped in a cup of hot water). You can add it to food, or stir it into juice, tea or milk. Capsaicin isn’t destroyed by heat, so you can use it in cooking as well. Topical application vary in strength and contain 0.025% – 0.075% capsaicin. You can also prepare at homecayenne warming oil for joint, muscle and arthritis pain relief.